Antigua, street view facing the Agua volcano. Antigua is a charming colonial town and one of the most beautiful communities in Latin America. The city was founded by Spanish settlers in 1543, and soon thereafter became the seat of Captain General of Guatemala. In the eighteenth century, the capital was moved to present-day Guatemala City, thus preserving much of Antigua’s present charm. Antigua is located just 30 miles west of Guatemala City and you can get here in 45-60 minutes from La Aurora Airport. As one of the most important cultural and artistic centers in Central America, Antigua has been designated a UNESCO World Heritage Site located in the Department of Sacatepéquez, (Cerro de Hierba). The city's streets are mostly laid out in a rectangular grid aligned with the compass, with the Parque Central as an origin point. Antigua is very compact and easy to walk around. Most tourist destinations are in within walking distance to each other. The Parque Central is a park in the center of town. The park is a city block in size, with concentric circular walkways threading among trees and a fountain in the center. The trees are decorated with lights, and there are plenty of benches for sitting and people-watching. The Inguat tourist agency, the city hall, and police office, the cathedral, and several banks and tourist businesses line the four sides of the park. Many Antiguans hang out in the park, and it has a pleasant, bustling, friendly feel during the day (at night, slightly less so... use your judgment). Visitors and locals alike enjoy the landscaped Plaza Mayor where you will find La Fuente de las Sirenas built in 1739 by Diego de Porres. Ringing the Central Park is La Catedral Metropolitana, El Palacio de los Capitanes Generales, El Portal del Comercio and El Palacio del Del Noble Ayuntamiento. Catedral Metropolitana was built in 1543, the cathedral has been semi-destroyed by earthquakes through the years, but is now partly restored and preserves the beautiful colonial details of its Spanish architecture. 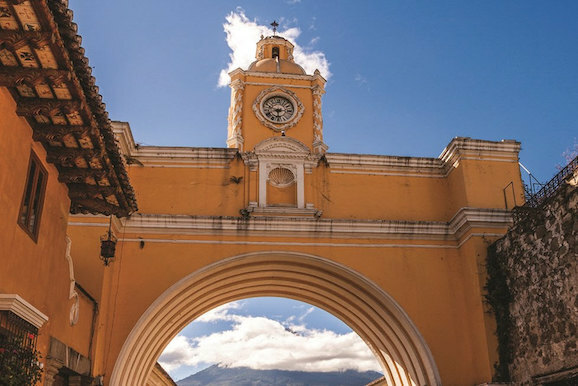 The Arch of Santa Catalina, which spans 5a Avenida Norte near its northern end, is one of the most famous — and certainly one of the most photographed — colonial monuments in Antigua. Back in colonial times, the Arch was part of the Santa Catalina monastery. 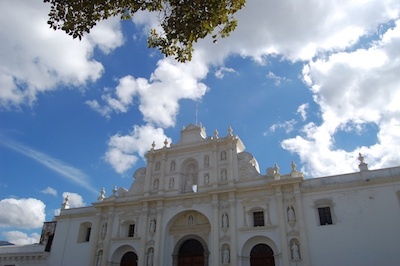 Built in the early 17th century, the church and convent were severely damaged by earthquakes in 1773 and later abandoned when the capital was moved to Guatemala City.